Look. Restricted with Ruth Nungarrayi Spencer/ Warlukurlangu Artists / Patrick Waterhouse. ANTWERP.- From 1 March 2019 FOMU presents the exhibition Restricted Images. When the first British colonialists disembarked in Australia in 1788, they looked hopefully at what for them was terra nullius: an empty, barren land that belonged to nobody. However, Australian Aboriginal society, the longest continuous culture in world history, operated so differently to their own that the settlers found it hard to comprehend what they were seeing. They were not able to understand the unfamiliar landscape or recognize such a radically different way of life. The settlers were unaware of the fact that these people had survived the Ice Age, successfully modified and managed the landscape, and handed down from generation to generation one of the longest oral histories on Earth, one that is derived from the belief that people and the land upon which they live are at one with each other. Ignorant of these facts, the settlers started drawing maps, dividing the territories, erecting houses and churches, searching for gold and laying down train tracks. This resulted in the newcomers displacing and destroying the indigenous communities along with decimating Australias ecosystem. For the past 7 years, Patrick Waterhouse (UK, °1981) has been taking photographs in Central Australia and acquiring documents that retrace Australias colonial history. Waterhouse then took his photographs - along with archival material obtained from museums and auctions - to the remote desert communities of Yuendumu and Nyirippi in Central Australia, where the Warlpiri indigenous group lives. He asked members of the Warlukurlangu Art Center to revise the documents through the traditional Aboriginal technique of dot painting, practiced by almost half of the communitys population. Drawing upon their own stories and traditions, the artists  a group of men and women aged from 16 to 90  applied layers of colourful patterns and symbols to the documents. This process can be seen as defacement, a correction of what was there, or the revelation of something that had always been hidden beneath the surface. The resulting work confronts Australias colonial narrative with its Aboriginal history, which began more than 50,000 years ago. In Native Tribes of Central Australia (1899), ethnologists Francis J. Gillen and W. Baldwin Spencer documented the Aboriginal groups living near Alice Springs, with an emphasis on photographing rituals and ceremonies. While these images set a new standard for anthropological photography, the authors were oblivious to the impact they would have on the lives of the Aboriginals. The pictures revealed the gap in knowledge between the authors  whose goal was to show the exotic natives in their natural state  and the subjects, who were unaware of the new medium and how it could invade their privacy. They also infringed upon Aboriginal cultural protocols by showing sacred sites and the dead. Over a century later, growing awareness of the legacy of colonialism has led to indigenous communities restricting the use of photography within their territories. Today, taking pictures in these areas is often prohibited and institutions limit access to the historical record. While such measures constitute a form of protection for Aboriginal people, they can also deprive them of the opportunity to be represented, and therefore acknowledged, as active participants in the history of their own country. With the complex history of the photographic encounter in mind, Patrick Waterhouse made photographs that were subsequently restricted by the person depicted or a close relation. 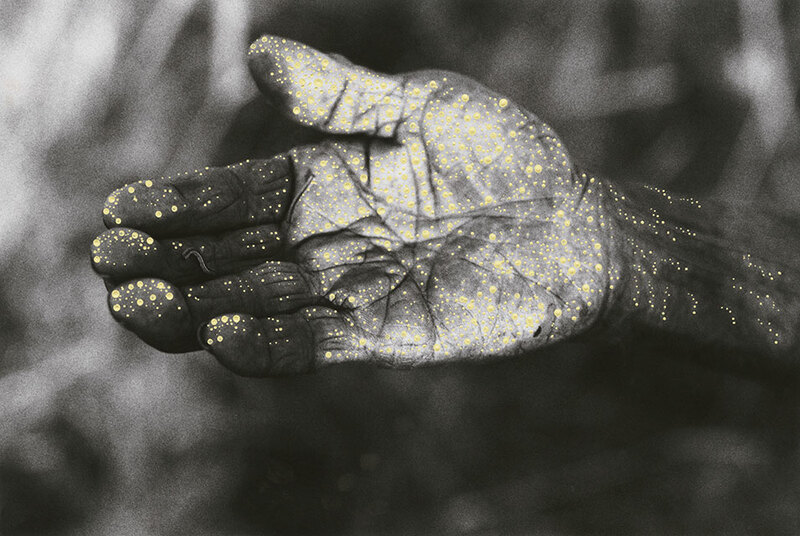 The Warlpiri see their land  or country, as they call it  not only as soil and minerals, but as a natural and spiritual environment that transcends time, linking the past to the present and human beings to all other creatures. This complex belief system  known as the Jukurrpa  was translated into English with the word Dreaming or Dreamtime. The sacred places that each Aboriginal group venerates and watches over are generally defined as Dreaming Sites. After years of photographing daily life in the Warlpiri communities of Yuendumu and Nyirripi, Waterhouse was invited to visit places of great spiritual significance. He would occasionally be permitted to make photographs there. However, it was only after his collaborators had added their markings that the work was able to address the unique relationship between identity and place.